The world of SDN and NFV is getting smaller as large companies continue to acquire smaller ones to enhance their offerings. Huawei dominated SDN and NFV social discussion early last week as news of their acquisition of Irish software development and SDN service solution company, Amartus, spread. This acquisition marks yet another major player expanding their software assets to accelerate their SDN offering and demonstrates “Huawei’s commitment to expanding its research and development investment in Ireland and across Europe.” Huawei was not the only company to gain attention for acquisitions last week, as discussion of Huawei’s recent acquisition occurred while SDxCentral’s interview about Brocade’s SDN & NFV Acquisitions was still trending. While Cisco saw attention for investing in the French software company 6Wind a couple weeks ago, this week they were caught in the crossfire of competing companies as Dell’s VP of Engineered Solutions targeted them and the effectiveness of their solutions. He said: “software-defined is kryptonite to Cisco.” Cisco is not alone on Dell’s war path, however, as Dell’s Ganthier also singled out HP as a company that “has followed industry trends more than it has led.” Speaking on his own company, Ganthier told CRN about Dell’s “’open’ and ‘agile’ strategy,” and how Dell plans to lead the market, not just react to change. The merging of companies and their technology is accelerating the path to software solutions, and Argus Insights is tracking everything along the way. Find out where you can stand against your competition, we would love to help you increase your standing and awareness, contact us for a free consultation. Receive updates about the SDN & NFV markets regularly with our free weekly newsletter. 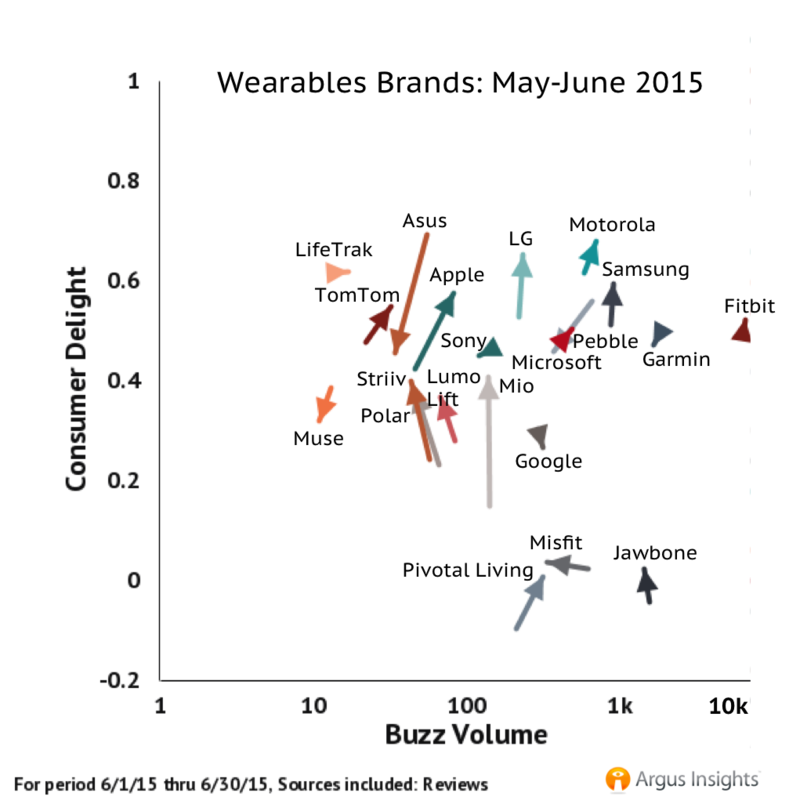 Consumer demand in the wearables market continues to fall, but the dynamics of consumer perception are continuously shifting. 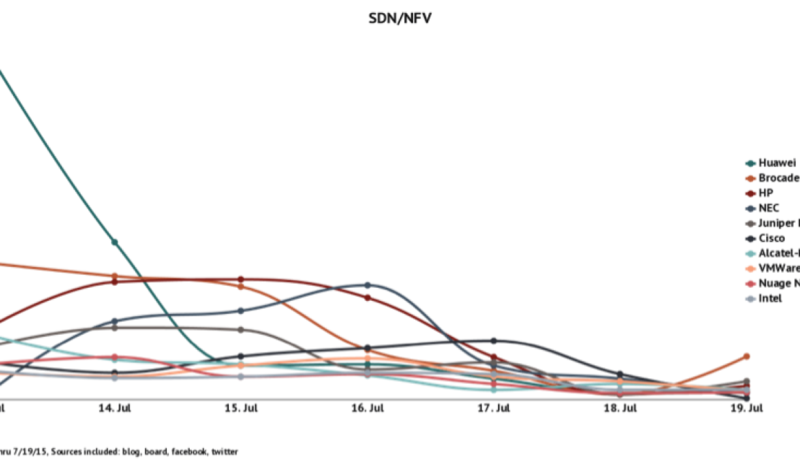 In terms of mindshare, Fitbit is dominating. After experiencing a drop in attention during November 2014, after the announcement of the Apple Watch, Fitbit has recovered to see a continually growing share of consumer attention. Aside from Fitibt, consumers are showing steady interest in Garmin and Jawbone and Samsung devices. 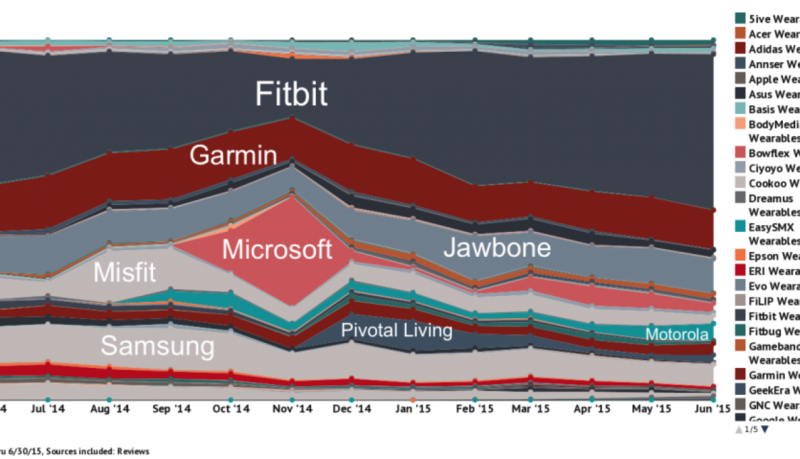 The top three most popular wearables brands, Fitbit, Garmin, and Samsung, hover below Motorola and LG in terms of delight. The Moto 360 continues to impress consumers, securing Motorola as the most delightful wearables brand of June. LG saw a boost in happy LG Watch Urbane customers to rank second to Motorola in terms of delight. While customers highly praise Garmin’s Forerunner 220 and 310XT as some of their favorite wearable devices, negative feedback for the manufacturer’s other devices drives down the brand’s overall delight. Despite being released for several months now, Apple has yet to really disrupt the market. Since Apple does not allow customers to review their products on their site, consumer feedback for the Apple Watch remains sparse. Most feedback is obtained through second hand sales on Amazon, and while it is not a comprehensive view of the Apple Watch consumer, these users are growing more and more impressed. 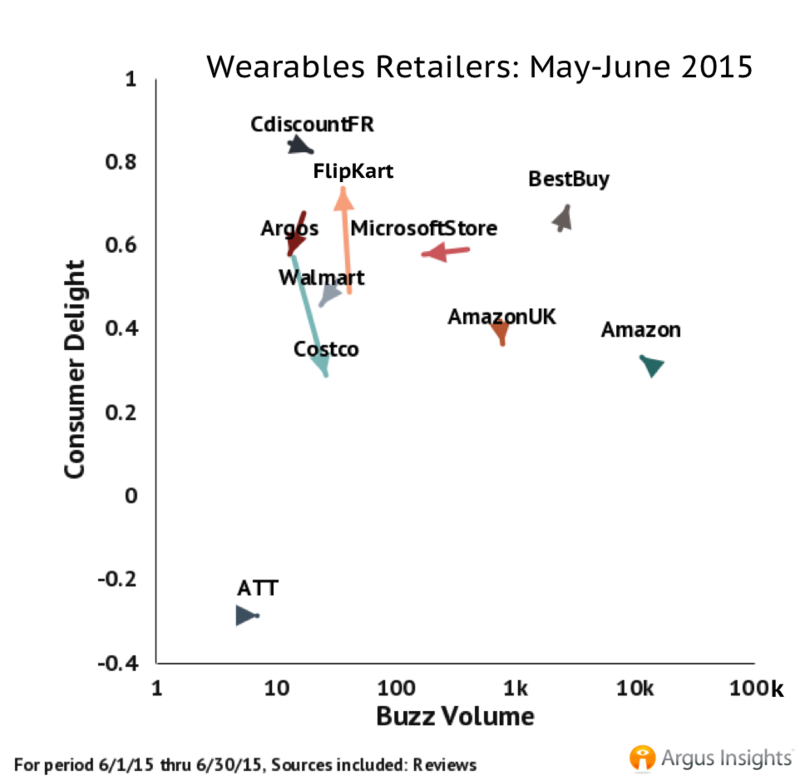 Brand Threat Quadrant plots review volume against consumer delight to demonstrate month to month changes in buzz and delight for all brands. Only the top most delightful and most reviewed brands are included in this chart. US consumers are displaying the most interest in wearable devices, as Amazon and Best Buy saw the highest volume of reviews this month. Best Buy’s high delight score was driven primarily by happy Fitbit and Pebble customers, while Amazon saw lackluster reactions to Fitbit devices and the most positive feedback from Moto 360 consumers. European wearables consumers are also extremely happy with the Moto 360, while negative perception of the Xioami MiBand is driving down the overall delight for Amazon UK. Wearables consumers are using their devices to help on their journey to a healthier lifestyle, as fitness continues to be top of mind for both smartwatch and fitness band users. While Fitness band discussion is full of praise for tracking steps, runs, bike rides, and weight loss, the looming threat of the sock drawer remains. 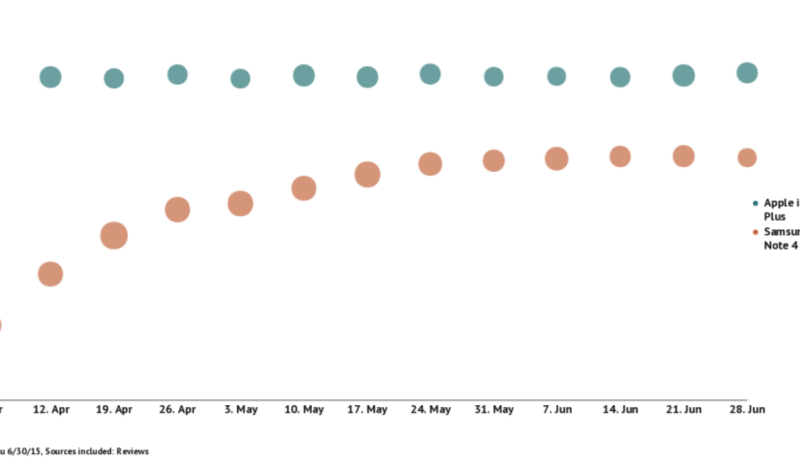 Some fitness band users express that after a while, they lose interest in their device and simply stop using it as they reach a plateau or lose motivation. While fitness is also a primary interest for smartwatch users, they tend to focus more heavily on using their devices for messaging, notifications, and social media, reporting dissatisfaction with messaging on these tiny screens. Argus Insights tracks consumer perception across the entire wearables market to gain insight and coach our clients to develop better products and surpass their competition. Schedule a time to talk with us about how we can help your company thrive in the fact of shifting consumer perception. Hungry for more insights, sign up for our free weekly newsletters to keep tabs on the Wearables, Smartphone, Home Automation, and SDN & NFV markets. Can Samsung sneak their way into the hearts of consumers with an early Note 5 release? Samsung is actively working to maintain an edge against Apple in the smartphone market as overall demand is dropping. It was recently announced that they will push forward the release their next Galaxy Note phone to early August in order to beat the announcement of Apple’s new handsets, which typically occurs in September. The Galaxy Note line currently finds its biggest competition against the similarly large iPhone 6 Plus. The models are neck in neck in terms of consumer attention, but the iPhone 6 Plus is better delighting consumers. The anticipated Samsung Galaxy Note 5 is rumored to have a sleek glass and metal casing, making the design extremely similar to an iPhone, and removing the option to replace the battery and casing. Expediting the release of their next handset in the Note line will successfully win the race to market against Apple, but the subtle changes will not likely incite consumers to buy, as an updated version of ‘the old’ is not new enough to rouse consumers to immediately upgrade. Demand in the smartphone market is shrinking, and Samsung’s relatively recent launch of the Galaxy S6 and S6 Edge did little to reverse this trend. Will this strategy of flooding the market with slightly updated new devices incite demand in a saturated market? It’s unlikely, especially considering the minimal impact of the Galaxy S6 and S6 Edge release. Stay tuned for a complete analysis of Q2 smartphone performance later this week to find out which brands are delighting consumers, and which are gaining mindshare in the midst of falling demand. In the meantime, stay updated with our free weekly newsletters!